As a painter, I love fabric — its fluidity and movement, in conjunction with vibrant color, adds much to the feeling of a work. 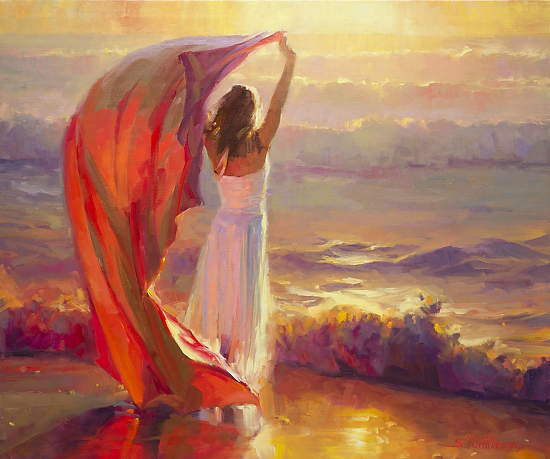 The young woman stands where surf and sand meet; facing the west and the setting sun, she is unaware of the irony of her exuberant, joyful pose — though she faces the end of the day, she stands at the beginning of hers. Ocean Breeze, original oil on canvas, 30 x 36, by Steve Henderson of Steve Henderson Fine Art.